Authentic Movement is a simple form of self-directed movement. It is usually done with eyes closed and attention directed inward, in the presence of at least one witness. 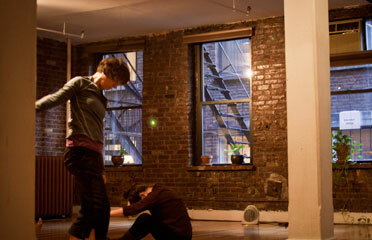 Movers explore spontaneous gestures, movements, and stillness, following inner impulses in the present moment. The witness watches and tracks inner responses to the mover with the intention of not judging, but focusing on self-awareness. Authentic Movement cultivates a contemplative frame of mind, clarity of perception, and movement that is personally enhancing. The particular relationship between mover and witness, in moving and being seen by another, creates a powerful framework within which this work takes place. Authentic Movement is practiced individually or in a group with an experienced teacher/witness. When more experienced movers are taught to become witnesses themselves, they may continue working with this method in peer groups and dyads. as a meditative, spiritual practice that integrates body and mind for increased access to consciousness. as part of psychotherapy process, for enhanced sense of self and and well-being; often bringing unconscious thoughts to awareness. as artistic support, to connect with creativity and creative process, unblocking and opening to new ideas. as community outreach and development in community long circles, that address and solve community-wide problems. Authentic Movement can be a discipline unto itself and can be used as a part of many different practices and teachings. Teachers develop the form in their own ways. Practices such as Movement Meditation, Contemplative Dance, Creative Movement Method, or Somatic Psychology use Authentic Movement as part of their training.